These cute little flowers are outside the door at one of our local Village Inns. The color is bright and the veining is unique so they always catch my eye. And lucky for me they bloom for quite a long while. I hadn't done any blending in a while so used this photo to try my hand at it again. 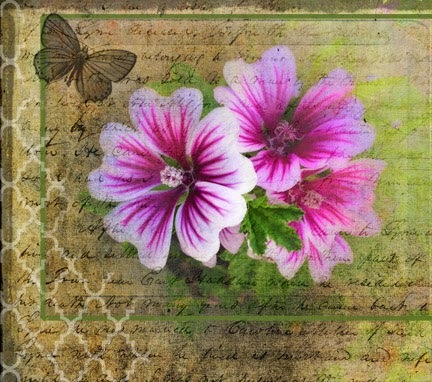 The background is script on vintage paper and I added Photoshop brushes for the butterfly and white pattern. I added a thin green frame to put more focus on the blossoms. Guess I haven't totally lost my touch! And Speaking of Owls . . .